1. In a 4+-quart soup pot (or Dutch oven) heat the olive oil at medium heat until a small piece of onion produces a sizzle. Add remaining onions and salt and sauté until softened, about 5 minutes. 2. Add the celery, carrots, sweet potato, tomato paste, ginger, garlic, jalapenos and stock to the pot and bring to a boil. 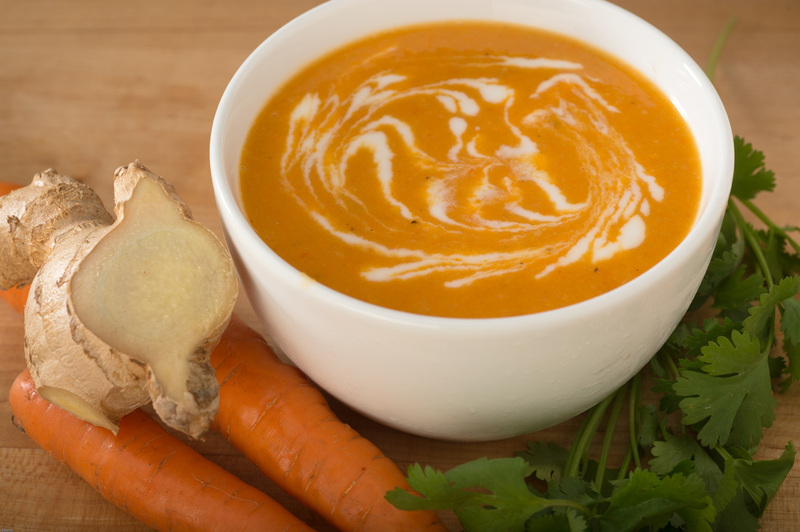 Reduce heat and simmer until sweet potatoes and carrots are soft, 30-35 minutes. 3. Add the coconut milk and bring to a low boil. Remove pot from heat and using an immersion stick, blender or food processor, blend soup until smooth. 4. Return soup to the pot and keep on low heat. Add lime juice to finish. Serve hot with cilantro and a drizzle of yogurt. Note: If fresh ginger is not available to you, use 1 Tbsp dried instead. -Get yourself an immersion blenders to save time AND dishes! If using homemade stock, choose a mild flavor like chicken, turkey or vegetable. Beef, lamb or other ruminant stock is not advised. © Darci Barman, LLC - 2014-2016. All rights reserved.